Enjoy finding great bargains without the hassle of the ’bargain basement’ experience! 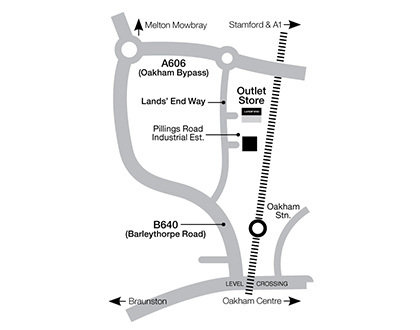 Unlike most other outlet stores, ours is light and airy – with comfortable fitting rooms and friendly, fully-trained sales advisors who are always on hand to help. Our outlet store is packed with first-quality clothing, footwear and accessories for all the family at 25%-70% off our original catalogue prices. We also have a selection of ‘not quite perfect’ items at even lower prices. Watch out for our regular Sale events and save even more. Every item you purchase from Lands’ End is Quality. Guaranteed. Today, tomorrow, forever. You can also pop in to order items from all our current catalogues – and while you’re here, you can also enjoy morning coffee, a quick snack or a delicious lunch in our restaurant.